As we learned in my last post, the tireless efforts of Edward Brennan simplified the street names and house numbers of Chicago. These street name and number changes cause confusion for researchers. Tracking down an address can be difficult if you do not have a modern street name. Some streets have had many name changes. Pulaski was previously called Crawford, and before that, it was 40th Avenue. To find out more about the history of any particular street in Chicago, you can look it up in Streetwise Chicago: a History of Chicago Street Names. One popular reason to trace the history of a street name is for family history research. If you find an ancestor’s address in the 1880 Census, then you need to convert the house number to the new system to figure out where they lived. We will use 20 Ann Street as an example. Checking whether a street name is still in use is the first step to confirm the location of a historical address. First, I checked the City Clerk's Chicago Street Guide to see if Ann Street still exists. It doesn’t. One way to untangle the knot of street name changes is to look at historical maps of Chicago. The MRL Map Index is organized by subject and chronologically. Some maps may have inaccurate information about street names. However, historical maps of Chicago are very useful in conjunction with other sources to determine where a street was and which name it had when. To unravel the mystery of Ann Street, I used A Guide to the Streets and Avenues of Chicago. For a more precise history of where a street existed and when exactly it changed names, the best source is the Municipal Reference Collection's Street Name Index. According to all these sources, Ann Street was changed to Racine Avenue. Most house numbers in Chicago were changed in 1909, so I looked up the new number in the Municipal Reference Collection's house number conversion guide: New and Old House Numbers. In 1909, Ann Street was still called Ann. 20 [South] Ann became 113 North Ann Street. In 1928, Ann Street was changed to Racine Avenue, therefore 20 Ann Street is now 113 N. Racine. Another popular reason to research street names involves finding the history of a house or building. Say you want to know more about your house, which was built in the 1880s. One way to check the history of a building is to use the Digital Sanborn Fire Insurance Maps, which were designed to assess fire risk. This 1916 map shows that 20 [South] Ann was renumbered as 113 N. Ann (arrow). Source: Digital Sanborn Insurance Maps, 1916, Vol. 6, Sheet 111. Sanborn maps show building outlines, building materials, type (single family dwelling, apartments, or commercial), and number of stories, as well as municipal infrastructure like water lines and fire hydrants. They may also have previous house numbers or prior street names since updated information was added to old base maps. 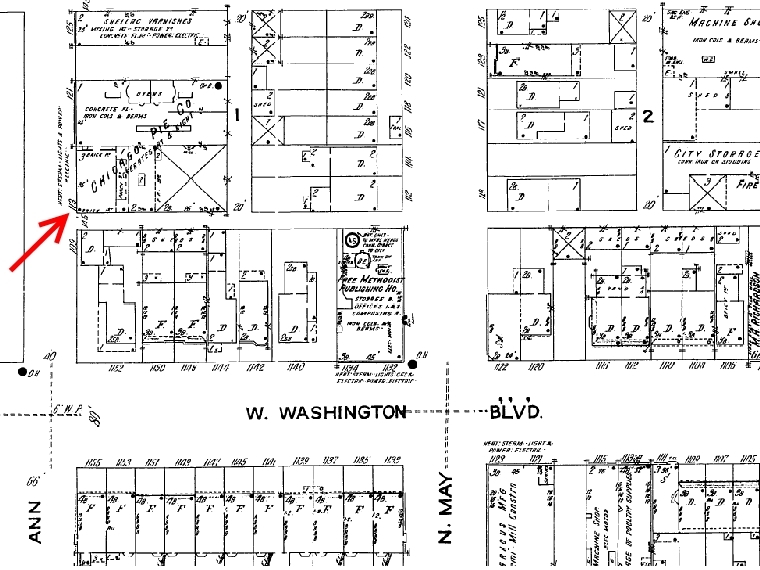 The Digital Sanborn Fire Insurance Maps have Chicago information from 1894-1951. You would want to start by looking at our Index. Additional years of Sanborn maps up to the 1980s are on microfilm, in the Municipal Reference Collection. Despite the extra effort involved in researching the history of streets and addresses, I am thankful that the City of Chicago implemented an orderly and consistent system of street naming and numbering. Brennan is truly an unsung hero of Chicago.